Image caption Piyush Goyal said the train was ‘zooming past at lightning speed’. The man in charge of India’s railways has been mocked for sharing a video of a “high-speed” train that turned out to be a time-lapse of a slower train. 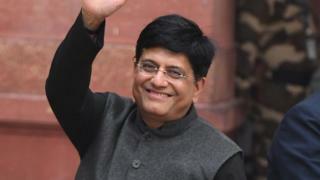 Piyush Goyal, Minister of Railways and Coal, tweeted that the train was “zooming past at lightning speed”. Trainspotter Abhishek Jaiswal then replied with the original footage, which he said he filmed in December for his railway-themed YouTube channel. In Mr Jaiswal’s clip, the same train travels at a much slower speed. In the video posted on his official Twitter account, Mr Goyal says the video shows “India’s first semi-high speed train built under ‘Make in India’ initiative, Vande Bharat Express”. As India’s railways minister, he is in charge of the fourth-largest rail network in the world. The train, Train 18, is indeed India’s fastest train to date. It will travel between the capital Delhi and Varanasi at a maximum speed of 130km/h (80mph). But in response, Mr Jaiswal tweeted a link to his version of the clip, which was posted to his YouTube channel The Rail Mail on 20 December. In that, the same train is significantly slower. Mr Jaiswal says the clip was filmed at Asaoti station in the northern state of Haryana. Indian news site Alt News then put the two videos together so they could be viewed side-by-side. Since the exchange, people have been mocking the minister online with their own videos of “high-speed trains”. Meanwhile, some offered their own editing expertise. Mr Goyal has yet to respond to the claims. However, he has continued to post videos of trains on his social media.